The credits of the Masterpiece Mystery TV movie The Lady Vanishes mention that the script (by Fiona Seres) is based on Ethel Lina White’s 1936 novel The Wheel Spins. But the reason the new film is titled The Lady Vanishes is that it was the name of the 1938 Alfred Hitchcock movie adapted from White’s novel. The movie is surely the main reason that White’s work is any better-remembered than most 77-year-old suspense novels. This Lady Vanishes really does stick closer to the original source material than it does to Hitchcock’s version. (The plot is set in motion by the villains’ efforts to protect a murderer’s alibi, as it is in the book. Hitchcock and his screenwriters, Sidney Gilliat and Frank Laudner, turned it into an adorably ridiculous spy thriller.) But technically, it’s a remake of a classic movie, and it must have been the recognition value of Hitchcock’s title, not the deathless brilliance of Ethel Lina White’s storytelling abilities, that earned this project the green light. The new film stars Tuppence Middleton, a young British actress who had a fateful collision with James McAvoy in Danny Boyle’s Trance, as Iris, who meets a nice old lady named Miss Froy (Selina Cadell) on a train and then, after Miss Froy disappears, is unable to convince anyone else that she even existed. It’s a perfectly decent set-up, which is why a thousand or so thrillers and horror stories and TV shows have used some variation on it. But the reason the Hitchcock movie is the “classic” version has to do with the way Hitchcock told that story, not the story itself. Which means that, unless the producers have access to some wild man director who has a personal obsession with the Hitchcock version and some daring ideas about how to reconceive it in a way that will smoke the old man’s style, a remake of The Lady Vanishes is as inherently pointless, as, say, a remake of Straw Dogs directed by the guy who made The Last Castle, with James Marsden and Kate Bosworth standing in for Dustin Hoffman and Susan George. Although there’s something unappealing about the idea that Iris the brat is redeemed by being thrown into a paranoid nightmare and having her life put in danger, Tuppence Middleton has some good moments as her character becomes uncertain and frightened and has some of her arrogance stripped away. (That’s more than can be said for Tom Hughes, as the smitten young man who comes to her rescue: He looks like a blanded-out version of Cillian Murphy.) The 1938 movie had such a rich, lively mixture of comedy and thrills, delivered in such a propulsive manner, that it was like a vaudeville revue crossed with a rollercoaster. The supporting characters here aren't that entertaining; they include a pair of old ladies doing a biddy version of Statler and Waldorf, and a bald minister who discourages his chatterbox wife from talking about their mysterious son, as if they were starring in Who’s Afraid Of Virginia Woolf? 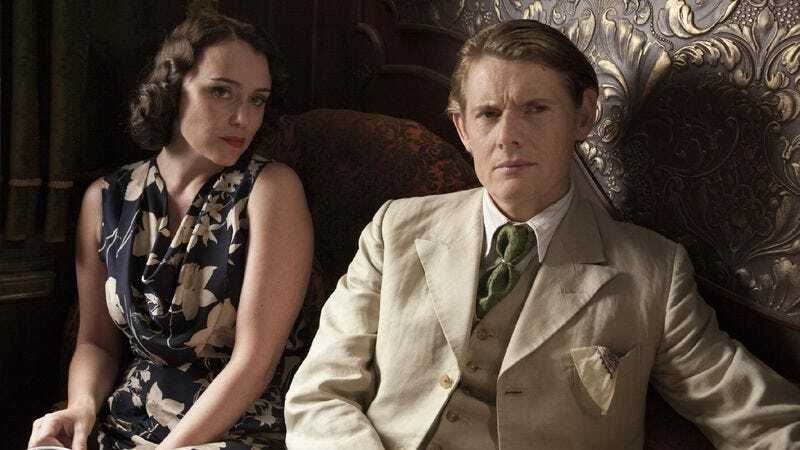 (Meanwhile, a joylessly adulterous couple played by Keeley Hawes and Julian Rhind-Tutt are doing their own upper-class-snooty take on George and Martha.) And instead of trying to capture some of the speed and power of the train in the camerawork and editing and using it to create excitement, Lawrence settles for lots of slow pans across the faces of people glowering at Iris disapprovingly, while ominous music is ladled over the images. The Lady Vanishes may not be the worst thing on Masterpiece Mystery this season, but it may well be the most unnecessary.